By 1913 New Zealand was one of the world's most highly unionised societies. In 1936 the first Labour government made union membership compulsory. Unions have played an important role in improving working conditions – but their power has waxed and waned over time, in response to political and economic influences. Workers can join together in trade unions to bargain with their bosses for better pay or work conditions. 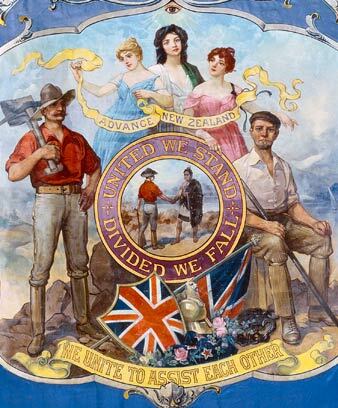 New Zealand’s earliest unions were mostly formed by English and Scottish settlers who had belonged to unions in Britain. Many workers set up or joined unions because they wanted an eight-hour work day and a 48-hour working week. In the 1880s unions won big victories, which encouraged many more workers to join. The Maritime Council – the first national labour organisation – was formed in 1889 by maritime workers and coal miners. The number of union members fell after the failure of a big strike by port workers and miners in 1890. After 1894 employers had to bargain with registered unions. If they could not agree, an arbitration court made the decision. Wages and working conditions improved, and more people joined unions. By 1913 New Zealand was one of the most unionised countries in the world. In the economic depression of the 1930s, many people lost their jobs. The unions lost members, and there were almost no strikes. A Labour government was elected in 1935, and worked closely with the union movement’s national body, the Federation of Labour (FoL). It became compulsory for workers to join the union that covered them. The government brought in a pension for all retired people, and two weeks’ paid holidays for workers. After the Second World War some unions were strongly influenced by communism. They left the FoL because they thought it worked too closely with the government. But these radical unions failed after the huge waterfront dispute of 1951. In the 1970s there were many strikes and disputes. Some people became annoyed with unions for inconveniencing the public. From the 1970s, women and Māori worked for better representation from unions. Sonja Davies became the first woman on the FoL executive, in 1981. Unions began taking a stand on issues such as apartheid in South Africa and the Vietnam War. From 1991 workers no longer had to belong to a union, and could make their own individual contract with their employer. Union membership fell.